Research shows that marijuana could more accurately be described as a “terminus” drug because the vast majority of people who use marijuana do not go on to use other illicit drugs. and new evidence suggests that marijuana can even serve as an “exit drug,” helping people to reduce or eliminate their use of more harmful drugs such as opiates or alcohol by easing withdrawal symptoms. 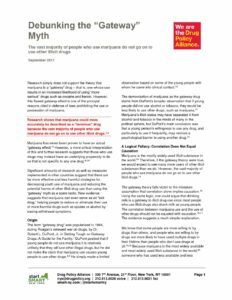 Significant amounts of research as well as measures implemented in other countries suggest that there are far more effective and less harmful strategies for decreasing youth use of marijuana and reducing the potential harms of other illicit drug use than using the “gateway” myth as a scare tactic. New York State cannot afford to continue to waste resources and ruin hundreds of thousands of lives with policies that are not based in reality.